IN a small bowl whisk together dressing, soy sauce and honey. Place chicken in a large resealable plastic bag. Add half the dressing mixture. Seal bag; refrigerate 4 hours. Cover and refrigerate remaining dressing until serving time. Coat grill rack with nonstick cooking spray. Preheat grill to medium (350-400F). Remove chicken from marinade; discard marinade. Place chicken and pineapple slices on grill. Grill pineapple 5-7 minutes per side. Grill chicken 6-7 minutes per side or until an instant read thermometer registers 165F. I say RECIPES because Valentine’s Day is around the corner so you may want to cook yourself or you and your significant other something great. I have tried out these recipes from Clean Eating Magazine and they’re amazing. Hope you all Enjoy!! Prepare topping: In a small saucepan, combine 1/4 cup water, cherries, and apricots and bring to a boil on medium-high heat. Boil for 20 to 30 seconds to reduce mixture slightly. Remove from heat and stir in orange zest, vanilla, and stevia: cover and set aside. Prepare toast: Heat oil in a large nonstick skillet over medium heat. In a shallow pan whisk eggs, egg whites and orange zest. Working quickly, dip each slice of bread into egg mixture and place on a plate until all slices have been coated. Slide bread slices (instead of lifting off the plate) into skillet and cook for 3 minutes per side or until golden. In a small bowl, combine chile powder, cumin, and 1/4 tsp salt. Heat oil in a large nonstick skillet on medium-high. Tilt skillet to coat bottom lightly. Season both sides of chicken with chile-cumin mixture and cook for 3 minutes per side or until no longer pink in center. Remove from skillet and set aside. Add orange juice and maple syrup to juice and bits left in skillet and cook for 1 minute to thicken slightly (until it measures 1/4 cup liquid), stirring constantly. Remove from heat, stir in chipotle chiles in adobo sauce and orange zest. 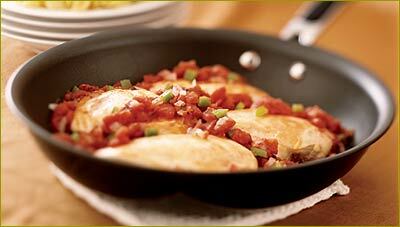 Add chicken back to skillet, return to heat and cook for 1 minute on medium-high, turning constantly. In a medium bowl, combine rice, cilantro and remaining 1/4 tsp salt. Serve chicken over rice and spoon any excess glaze over top of chicken pieces. Fill 2 medium pots halfway with water and bring to a boil. Add beans to 1 pot and turn heat down to medium. Simmer beans for 5 minutes; drain and set aside. Add potatoes to second pot reduce heat to medium and simmer for 8 minutes; drain and set aside. In a small nonstick pan, saute garlic in 1 tbsp oil over medium-low heat for 2 minutes. Add ginger and cook for 1 more minute, then remove from heat immediately. In a small bowl, mash garlic-ginger mixture with a fork until it’s a smooth paste. With same fork, stir paste into potatoes. Chop cooled beans into 1-in long pieces. Heat remaining 1 tbsp oil in a nonstick pan over medium-high heat. When oil is just beginning to sizzle, add chicken and saute for 3minutes. Add green beans and corn and continue to cook for another 2 minutes. (the chicken will finish cooking by method of poaching, thanks to the liquid from the vegetables. This turned out so great I thought I would share it with you guys. This will be done in 20 MINUTES!! Quick and easy why not try it?? In a large skillet over medium-high heat, heat the olive oil, add the turkey and saute until cooked through, approx. 7 minutes; remove turkey from the pan and set aside. Add the cilantro and return the cooked turkey to the pan; simmer 2-3 minutes until heated through. Serve immediately over rice or greens. Don’t have time for breakfast? Try this recipe out! Combine the first 7 dry ingredients in a large mixing bowl. Combine applesauce, brown sugar, and vanilla in a small bowl and add to dry ingredients. Add dried fruit and mix well. If mixture is still dry add 1/4 cup more applesauce. In a bowl, whisk together the chicken broth, soy sauce, honey and arrowroot until blended. Set aside. Heat a large skillet or wok over high heat. Add 2 tsp. toasted sesame oil and the chicken; stir fry until the chicken is no longer pink, about 10 minutes. Stir-fry until sauce thickens and boils, about 5 minutes. Serve over brown rice or noodles.